Much of the Midwest experienced consistently higher than normal temperatures during the 2016 growing season. The warmth lingered into the fall and, according to the The Climate Corporation Weather Science Team, air temperatures registered an astonishing 5-10 degrees F above normal since the beginning of October. Warmer air temperatures also mean warmer soils, and North America Land Data Assimilation System (NLDAS) data gathered by the Weather Science Team indicate that soil temperatures have been 2-4 degrees F above average. Record high maximum and minimum temperatures were consistently recorded throughout the Midwest during the autumn months with over 500 high temperature records broken during the first week of November. Large portions of the Midwest also registered near-record late frosts and freezes. The growing season heat wave accelerated crop development, prompting early harvests in some areas and distributing crop residue across fields earlier than usual. 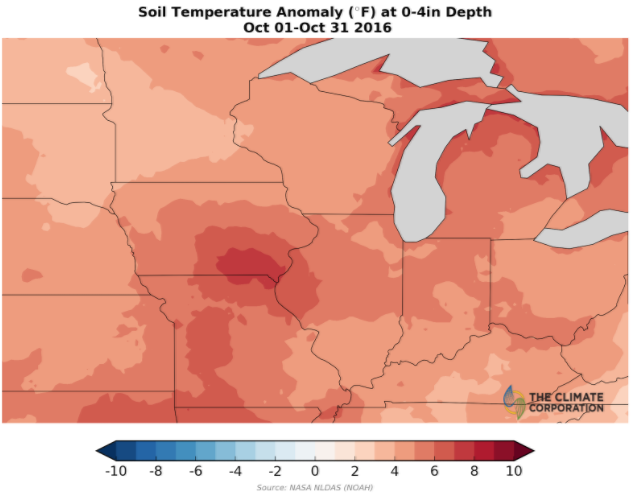 The unusually warm weather has continued into the fall across some of the Midwest, which can increase the breakdown and decomposition of residue and soil organic matter, causing many farmers to wonder how these conditions will affect their fields and inputs. So, what does this above average warmth mean if you are considering a fall nitrogen application? And, are there general guidelines you can follow to ensure you get the best results from your input investments? Warm soil and air temperatures during the fall can affect the carryover of nitrogen from this year to next. 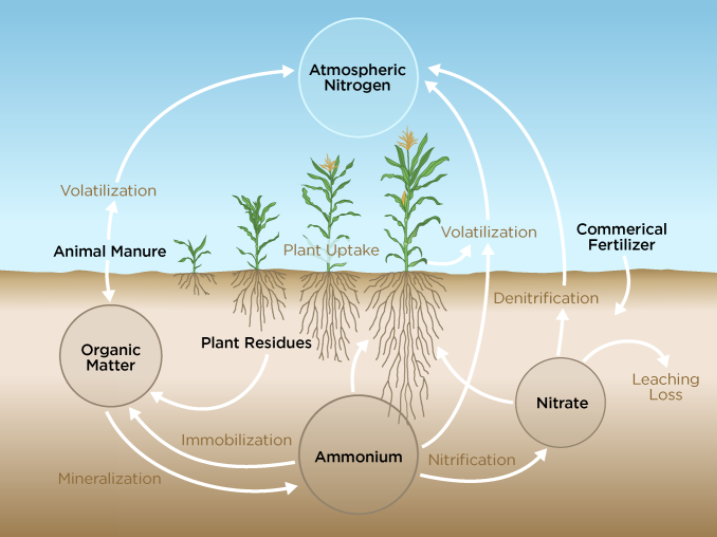 Organic matter decomposition and nitrogen mineralization (which produces ammonium), followed by nitrification (the conversion of ammonium to nitrate) occurs quickly when it is warm, and slowly or not at all during freezing temperatures. The recent abnormally warm weather may have resulted in substantial nitrate buildup over the past few weeks, meaning soils are primed for leaching (losses of soluble minerals and inputs) if large rainfalls occur between now and planting season. These losses can reduce the amount of available nitrogen during next year’s growing season. To better understand how warmer temperatures can affect soil and nitrogen inputs, The Climate Corporation Weather Science Team evaluated 800 fields across eight states, including Iowa, Illinois, Indiana, Michigan, Minnesota, Missouri, Ohio and Wisconsin using Nitrogen Advisor, available in Climate FieldView™ Pro. These tests were conducted during the recent period of warmer-than-average fall temperatures (October 1 – November 8). Residue and soil organic matter showed significantly higher than normal rates of mineralization. For many fields, compared to historical weather conditions, rates of residue and soil organic matter decomposition may have been near record levels. In addition, nitrification rates were also much higher than average, again approaching the highest levels that many fields might experience when compared to historical weather data. Consider applying anhydrous when soil temperatures in your fields register at 50 degrees or less and continue to show declining temperature trends. Our advanced weather models indicate that many soils across the Midwest are approaching, but have not quite reached, ideal temperatures for anhydrous application. Also, you should keep in mind that most states and extension agencies recommend using a nitrogen stabilizer with fall anhydrous applications. The key this year is to make sure soil conditions are as favorable as possible to help maximize your input investment. Warm fall weather is presenting challenges for managing nitrogen this year and may require new approaches and tools to help you make the best input decisions as you look forward to planting season. Nitrogen management and monitoring tools, available in FieldView™ Pro, help you track the available nitrogen in your fields and provide data than can help you make confident decisions and manage the risk of increased nitrogen losses in the coming months. So be prepared and we’ll continue to keep you updated as we learn more about how this warmer weather could affect you both now and during the upcoming planting season. Brian grew up grain farming in Ohio and leads fertility research efforts at The Climate Corporation to develop high-value advisory products that help farmers make important decisions with confidence.